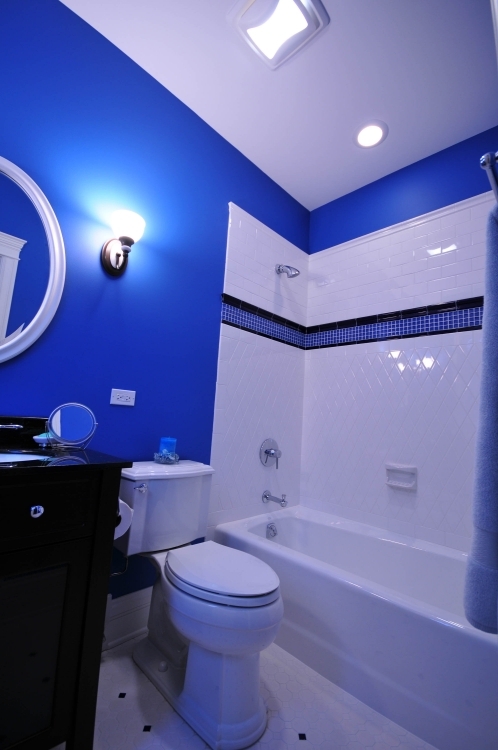 Bright blue bathroom with a white ceiling and white tub, toilet and tile. Painting the walls and ceiling is a relatively quick, cheap and effective way of smartening up your bathroom’s appearance. However, rather than simply slapping on a coat of paint, there are a number of things you should do in preparation, to ensure you get the best possible finish. For example, if you’ve got patches of mold in your bathroom, painting over them may disguise the problem in the short term, but it won’t cure it. Within a few weeks, the mold will begin to reappear. A longer-lasting approach is to take the time to wash off any mold using bleach and water, before you paint. Once you’ve adequately cleaned and prepared the surface, paint it with a specialist bathroom paint that is formulated to resist mold and mildew. Then, to further reduce the risk of mold growing on your new paintwork, take precautions to increase the circulation of air and reduce humidity in your bathroom. Bathrooms are hot and steamy environments that are prone to condensation. You can take steps to control moisture levels by installing an extractor fan, or simply opening a window after taking a shower or bath. Regularly wiping down areas that are susceptible to mold with a bleach and water solution is also good practice. When decorating a bathroom, all the usual preparation work should be done, such as removing any loose or peeling paint, sanding down woodwork and bumpy surfaces, and filling any holes. Unlike most other rooms in the home where you can easily move items of furniture to one side, bathrooms have a lot of fixtures that can’t be moved, which you’ll need to work around. It’ll make your task much easier if you remove as much as you can from the bathroom before you begin, including all toiletries, accessories, towels and trash cans. If you can unscrew them, remove any bathroom cabinets, towel rings and toilet roll holders from the wall. Alternatively, stick masking tape round the edges of each obstacle to stop paint getting everywhere. It’s a good idea to use masking tape round the edges of your tiles, and where your tub, sink and toilet join the walls. Cover your floor and any other surfaces with a dust sheet. If you do accidentally get a few paint splashes where they shouldn’t be, make sure you wipe them off quickly before they get a chance to dry. As a general painting rule, start with the ceiling and work downwards, moving onto the walls, then the skirting board and other woodwork. If you’re painting a dark colored wall with a lighter paint, you’ll need several coats to cover it up completely. A handy hint here is to apply a couple of undercoats of basic white emulsion, which is much cheaper than colored bathroom paint. 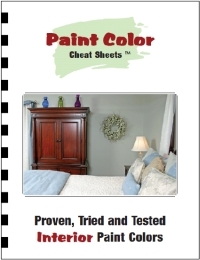 Once the original color has been adequately covered, you should then only need two coats of your chosen color.